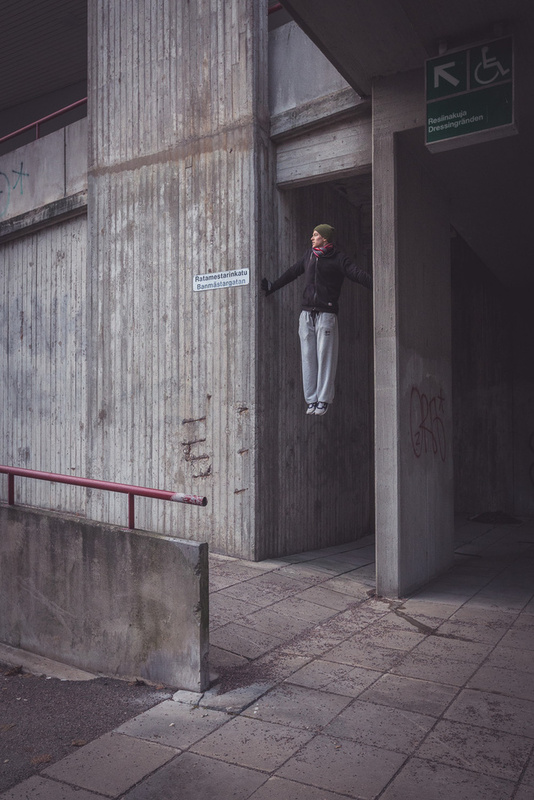 Parkour athlete and coach Juho, hanging out in the beautifully brutalist Pasila district of Helsinki. A density of concrete offers plenty of potential for creative, physical interaction with architecture. Shooting on a December day just before the heavy snows arrived, conditions were cold, damp and with very short days, we were moving around the city quite quickly. Juho is phenomenally strong and moves exquisitely - something you don't expect from a man of his size. We were exploring this underpass, climbing a few obvious lines, when suddenly Juho paused between movements, turning to me with a brief look of amusement as he realised his situation. In classic Finnish style, his expression quickly turned back to deadpan and he looked off into the distance as if to look to see whether his bus was coming.